What is a security laminate? It is a micro-thin and transparent film that is applied to the interior side of your existing glass to make it highly resistant to natural disasters, break-ins, bullets, and even bombs! How thin are your security laminates? Incredibly thin. Our AC7 is 7mil (0.007 inch), the AC9 is 9mil (0.009 inch), and the AC14 is 14mil (0.014 inch). Do you offer just the clear product or do you have tinted shades? Our films are available in clear, tints of grey, and a silver reflective. I already have an alarm, do I still need security film? Absolutely! Alarms just make lots of noise but does nothing to stop an intruder from entering your home or business. Most criminals know that they have plenty of time to get in and out before authorities show up. Our laminates combined with an alarm provides the ultimate in protection. The alarm will alert authorities while the intruder is still outside. The real magic is in the hyper-aggressive adhesive. Once cured onto the glass, it will provide a super-bond that makes it very difficult to peel off. If there is an impact on the outside of the window and the security laminate does not peel nor break, the force is distributed across the surface of the security laminate and thus diminishes the impact. No. Pricing starts at $8/sf installed and we offer grades of security film ranging from 7mil up to 14mil thick. The best way to get an estimate is to provide us measurements of each pane of glass you want to secure. Just call or email. Will it peel, bubble, change colors, or distort? No. Our security laminates are guaranteed for life against these types of problems. The reason these things happen on cheap films are because the sun breaks down the adhesive. Our adhesive will not be broken down by the sun, and in fact, the sun actually makes the film bond stronger. How do you clean the windows with the laminates on it? Windex and a soft cloth would work great. Can an intruder use a glass cutter to break in? No. Glass cutters score glass so that its easier to punch in on untreated glass but our security film will prevent the ability to punch the film in. Will security laminates make my car windows bullet-resistant? No. Car windows are much too thin to offer bullet-resistance. What Armorcentric can do is offer an incredible amount of break-in resistance to protect you , your family, and/or property in your vehicle. If its so break-resistant, how can we get out in case of emergency? Typically, you should still be able to open your window to get out but if it was stuck, the security laminates offer one-way protection so you can break out but its very difficult to break in. No. 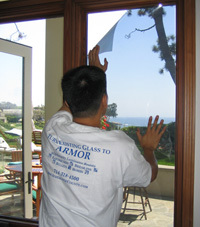 Our product is designed to discourage break-ins by resisting penetration through the glass and laminate. Each product has a specified break-strength and once that is exceeded, the product will tear. Note that a hole or tear does not necessarily mean they can enter through such a small hole and continued effort would be required to get in. Most times, our product is sufficient to stop break-ins but that being said, at no time do we represent that this will ultimately stop an intruder from getting through but we will make it harder.